High Sugar levels in Grass or Myco-toxins? Are myco-toxins present on the surface of the leaf blade responsible for spooky behaviour. There is a big difference and both are caused by environmental conditions but the actual causative factor is very different working on different parts of the horse’s physiology. High sugars and low magnesium levels will lead to excessively spooky and reactive behaviour which will act on the adrenals making the horse more reactive to stimuli. Myco-spores on the other hand when ingested act on the neurological system making the horse ‘see’ and ‘feel’ things that don’t exist. In other words the are experiencing a mild form of a trip one would get when taking magic mushrooms. Typically the synapses to stimulate movement may be disrupted and the horse’s movement becomes jerky and poorly co-ordinated. This is potentially dangerous for horse and handler. Myco-toxins and toxin binders are a vast subject and too complex to be discussed here. In short, if the horse gut flora and the soil microbiology is at optimal levels, then the effects of fungal toxins are able to be managed as part of the normal biological cycle. For the purpose of this article I will discuss just the high sugars. Now with the advent of new grass and paddock species, usually with higher than normal high fructan levels tailored toward milk production, the problem with grass affected horses increase yearly. It pays to understand just a little about the photosynthesis cycle so that you know when it is ‘safe’ to put your horse out to pasture. It also will pay to look at changing your paddocks to horse friendly pastures. Now it is conditions with low night temperatures and warm sunny days that increase fructan levels in grass which can give your horse a sugar high if put out to pasture at certain times of day. It is important to realise that the horse is designed to eat fibre which is held in an organ called the cecum, where the gut bacteria to break down the cellulose, plant cell walls, ‘woody’ ‘stalky’ fibre. which is responsible to maintain the horse’s metabolic state. It is very important to remember that horses require this slow release source of energy over the winter to maintain the correct pH. What you do not want is excess NSC (Non-Specific Carbohydrates) found in lush new grass. Too much NSC and too little work and your horse will more toward a state of acidosis leading to unwanted acid loving bacteria.The first flush of grass which is NSC will acidify the system and your will get a particular type of acid loving bacteria. This will affect her hormones and you will have a stroppy mare. What are Fructans in Grass? Fructans are fructose chain molecules, a type of sugar which is the by-product of photosynthesis which manufactures energy in the form of starches. On sunny days, fructose is produced in large quantities and stored within the foliage. When it cools off at night, these fructans are used for growth and cell division meaning the sugar sources are generally depleted for growth. However if temps drop below freezing the sugars are stored. The safest time of day for horses at risk for grass founder to graze is early in the morning and if a frost has occurred before temperatures rise above 10deg. Higher in the seasons when the nights are cold and the days warm and sunny, usually during spring and autumn when night-time temperatures drop below 10 deg therefore the excess remains stored in the stems. Higher in stressed pastures than in lush grass. Sugars accumulate in dehydrated tissues. How do Fructans Affect Horses? Fructans are a non-structural carbohydrate that horses cannot digest without beneficial micro-flora in the hind gut. Fructans require the activity of these micro-organisms so that they can be absorbed. Horses that have been on hay and hard feed all winter, will only have gut flora to digest that feed. It is essential that the micro-flora in the hind gut have time to adjust to these changes by having a gradual lead in period to adapt and multiply to adapt to what is being eaten in particular increased fructans. This is essential for horses prone to laminitis and colic. The types of microorganisms in a horse’s hindgut vary according to the types of food it eats. The microorganisms are unable to digest the change in levels of fructans causing beneficial micro-flora to die. When beneficial microflora/ bacteria die off, the acidity of the hindgut is raised (lactic acid is produced) and harmful pathogens are released. The lactic acid and pathogens are absorbed into the bloodstream and are known causes of laminitis. Colic is known to occur if the acidity level of the hindgut changes rapidly. The Equine Gastro-Intestinal Tract ( GIT) consists of various components stomach, small intestine, and hind gut with the cecum accounting for 15% of the total GIT and the colon 38% of the total GIT. It is in these two organs that the digestive/fermentation micro-flora reside. Diet is the main factor will permanently change the real estate and pH in the gut. Adding pro and pre biotics will provide temporary cover by means of a form of inoculation. For the horse to gain the benefits of supplements and nutrients in the diet , the microbiome must be fed first. ie a diet high in natural fibre preferably through browsing on biodiverse plants ie hedgerows, branches, berries seeds, stalky grasses. Because live yeast can effectively out-compete starch-degrading bacteria such as Streptococci for sugars, Streptococci numbers are reduced, and as a consequence the lactic acid that they produce as the end point of starch fermentation is decreased. Make some changes to your equine environment so that your horses have unlimited access to a range of plants that will provide insoluble fibres. 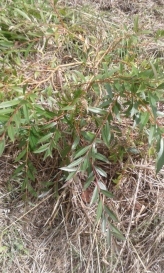 Horses love to browse on Salix alba (white willow bark) and Camellia sinensis . 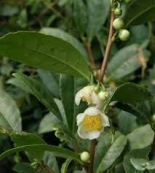 (The Green Tea plant). Looking at increasing the fibre intake needs to be considered as we come out of winter when horses should have had the bulk of their feed as insoluble fiber so the gut pH is higher therefore out-competing acid loving pathogenic bacteria that lead to endocrine and behavioural problems. It is not just about attempting to introduce pro and pre-biotics. Get the internal environment right through increasing the ratios of fibre to concentrates and/or NSC and the microbiome will self adjust. Autumn and spring particularly brings the need for magnesium supplementation. 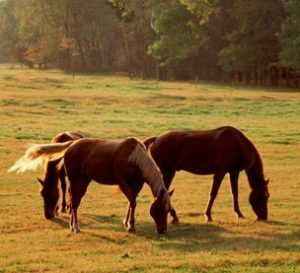 The best time to graze your horse is a couple of hours after sunrise and again later in the evening as the sun sets when sugar levels are at their lowest. Ensure that your horse has access to a range of plants that will provide the full spectrum of plant fibres ie woody, stalky tissues, the hard insoluble endosperm of various seeds, bark for a range of trees and shrubs, leaves with a hard waky layer etc. Applying a biological tea and improving soils biodiversity will reduce the need for expensive supplements and toxin binders. Ensure your horse has sufficient salt (sodium chloride) this helps maintain the correct sodium/potassium balance. Imbalance can lead to neurological problems and can affect adrenal function. Topdressing with dolomite will add calcium and magnesium to the pasture. High sugars lead to excess glycogen storage in the muscle fibres which makes the horse more reactive. See Nervous horses Ensure that you lower the GI of feed by adding fats or oils to the diet. Coconut oil is the best oil.This will help manage sugar peaks and insulin disruption. Another good oil is rice bran oil as it is from the grass family (moncot) and likely to be ingested while grazing in the wild. Just be aware that horses like us, need a break from intensive training so make sure you change the routine and have some ‘fun’. Lots of low relaxed walking will help lower adrenal reactivity; reduce cortisol levels which in turn will reduce the need for magnesium supplements. Ensure that your horse gets sunlight with out the cover on for at least two hours a day. This will help increase calcium, vitamins A and D levels, all responsible for maintaining deep organ health as well as the nervous system ie levels of serotonin responsible for feelings of contentment. Look at enhancing melatonin production by keeping to natural circadian rythms ie sufficient sunlight to the retina as well as the body. (if you worry about the coat fading through sun exposure take covers off when UV levels are lower. DISCLAIMER: The information in this page must not be used in place of professional veterinary treatment . We recommend that either a qualified herbalist or your animal professional carry out diagnosis and subsequent treatment. Herbal remedies must not be given not be taken in conjunction with other medication with out consulting a medical professional.